This harbour is now known as the ‘Portsmouth Olympic Harbour’ but it was originally called ‘Hatter’s Bay’. 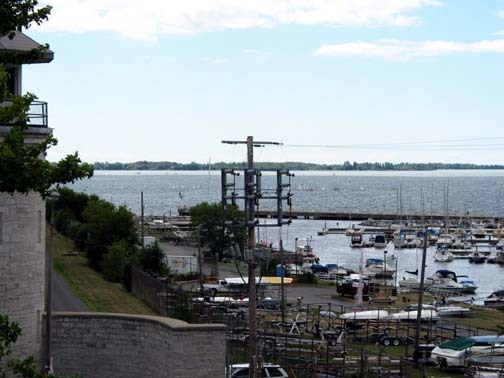 The protected harbour with ready access to the open lake was one of the reasons that the penitentiary was built here. The waterway was the main transportation route in the 1830s and therefore offered a means of transporting prisoners and supplies directly to the penitentiary. This position also provides a good vantage-point to examine the Kingston Penitentiary. Construction on the institution began in 1833. There is some debate as to who initially designed the prison, but after William Coverdale became prison architect in 1834, he designed and supervised the construction of the majority of the buildings. Edward Horsey, who later became penitentiary architect, was also responsible for the design and construction of several prison buildings starting in 1858. Within the walls, the penitentiary is composed of several buildings. The first building to be built was the South Cellblock. 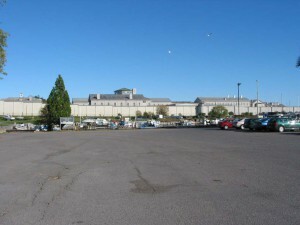 By the time of the arrival of the first six prisoners, on June 1st 1835, the South Cell Block was ready to house them. The rest of the institution was built using prison labour over the next fifty-nine years and final construction was finished about 1894. However, due to its age by that time, the prison almost immediately began to undergo its first major renovation. This project saw the gutting of the cellblocks and the enlargement of the cells from a width of 29-inches and a length of 8-feet, to a width of 5-feet and a depth of 10. The original stone wall and tower system was built in stages to replace the decaying plank wall and was completed by 1845. When examining the prison layout you can see that the main building consisted of four cellblocks, which are connected by a circular rotunda. This circular rotunda is called the “Dome” and is the heart of the institution. However, this was not completed until 1861. In the beginning, each cell contained a bed, which when lowered occupied the whole area of the cell except for a small spot at the front, where each prisoner had a night pail for use as a toilet. Running water was not introduced to the cells until the renovations of 1895 to 1906. It was the duty of the convict to “be constantly employed at hard labour except on Sundays, Christmas Day and Good Friday”. When not at hard labour, each prisoner was locked alone in his or her cell. Artificial light was not used in the cells until 1870, when plain oil lamps were introduced as a reward for good behavior. The fear of fire was well justified as each cell was supplied with a straw mattress!